If you've ever had the tedious job of manually scrolling through a long list of data to remove the duplicate entries in Excel then this blog is for you! 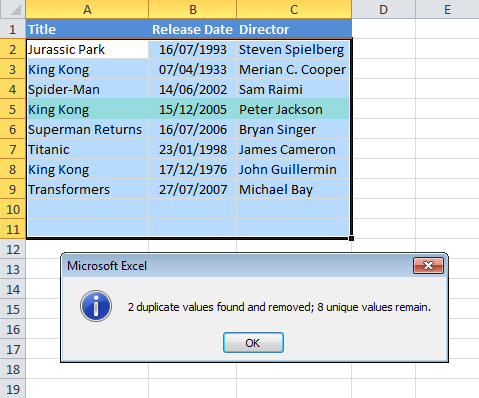 Discover how to hide or delete duplicated data in Excel 2003, 2007 and 2010. The duplicate entries are shaded in green - we want to get rid of two of these rows. 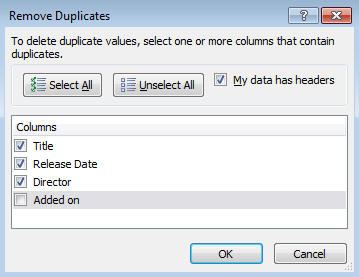 Select the list containing the duplicates you want to remove, or just click on a single cell somewhere in the list. 3. Choose whether the list has column headings. When you click OK you'll be presented with a dialog box telling you how many rows have been deleted. The dialog box tells you how many rows were deleted. 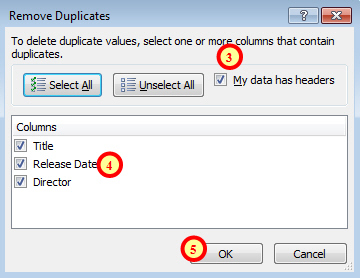 Take care when removing duplicates using this method because the duplicate rows are deleted from the list rather than simply hidden as in Excel 2003. In this example we've recorded the date and time that each film was added to the list. There are three records where the film data is duplicated but the date and time is different. Here we'd simply choose not to include the Added on column when comparing the rows. The end result is that we'd delete the rows where only the Title, Release Date and Director values are the same. 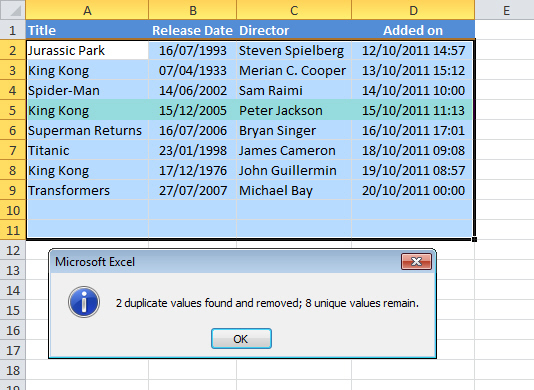 Excel keeps the first instance of the rows that contain duplicates. Select the list or a single cell within the list. You'll see the same dialog box as in Excel 2003. Simply check the Unique records only box to hide the duplicates rather than delete them. And that's the end of this blog! There are lots more resources on training in Excel here.